As an administrator, you can change your password and security question by going to your profile in Configuration Manager. Enter a Security Question for additional password protection. The security question is offered when you request your password to be reset. You must answer the security question to receive a link with the temporary password. If you forget your password during login, you can reset the password. When you reset the password, you receive an email communication with a temporary password. The reset password is your gateway to change the password. When you log in with the reset password, you are prompted to change the password. The changed password takes effect from the next login session. 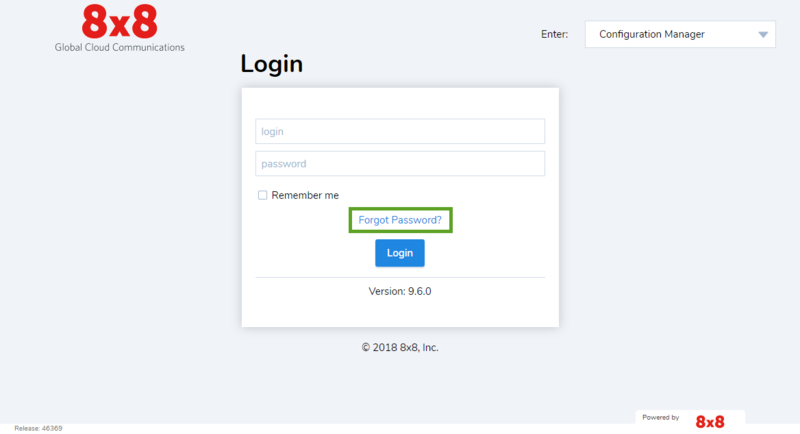 The login fails if you do not change the password. Go to the Configuration Manager login screen. A Reset Password window appears and you are prompted to enter your user name. Enter the User Name, and click Continue. A message indicates that the reset password will be communicated to your email instantly. Retrieve the temporary reset password from the email communication. If you have set the security question, you must answer it first in order to receive the link with a temporary password. Log in to Configuration Manager with the reset password. Enter a new password, and click Change. The changed password takes effect from the next login session.